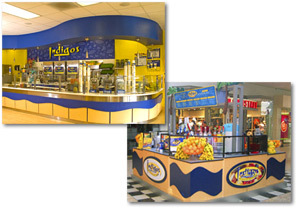 If you are looking for information on the Indigos Fruit Smoothies franchise business opportunity, Indigos franchises or Indigos Smoothies franchising, then you have come to the right place. At Indigos, we're passionate about helping our customers lead healthy and active lifestyles by offering a fresh and lighter approach to fast food. Our success is largely the result of the overwhelming response to our delicious mouth-watering Fruit Smoothies, Fresh Squeezed Juices, Premium Nutritional Boosts and our Healthy Meals served in a fun, high energy and uplifting store environment. We have created one of the best Smoothie / Juice Bar concepts in the industry. Blending our incredible tasting Fruit Smoothies, Fresh Squeezed Juices, Salads, Pitas, Soups and Much More into one outstanding location, has positioned us in a unique place between a Smoothie / Juice Bar and a healthy eating restaurant. Our delicious product mix attracts customers to come in for breakfast, lunch, dinner, and snack times. One of the greatest niches of the Indigos concept is our "Create Your Own" Entertaining Experience. This gives our Indigos Team Members the ability to customize every Fruit Smoothie, Fresh Squeezed Juice, Salad and Pita to suit the customers individual tastes and/or diet. This allows each customer to get exactly what they want while it is being prepared fresh, right in front of their eyes. Our focus on superior fresh fruit and vegetables, outstanding customer service and upscale vibrant store environments has positioned Indigos as a leading innovator in the Smoothie / Juice Bar industry creating a fantastic opportunity for entrepreneurs that share our commitment to excellence. The Smoothie explosion is fueled by a new generation of health-conscious consumers who are seeking FAST, FRESH & HEALTHY nutritional meals as an alternative to high fat, empty calorie fast foods. Entrepreneur Magazine called Juice & Smoothie Bars one of the hottest new trends for the future! 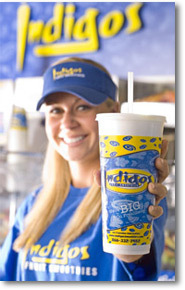 Smoothie sales reached over 2 billion last year in America. The National Health and Nutritional Examination Survey stated that two out of three people in the US are obese or overweight. Analysts are calling the health and wellness industry "the next trillion dollar industry"- literally billions of dollars are being spent on products that promote better health and a longer, healthier life. Consumers list the benefits of smoothies as: healthy, nutritional, tasty and part of an active, fun lifestyle. As you can see, the smoothie industry has experienced exciting growth in the last few years with no signs of slowing down. The awesome taste, nutrition, value and convenient portability of smoothies have made them an ideal meal replacement and/or a Grab-N-Go healthy snack for busy people on the GO! As soon as you join the Indigos Team, our clear and detailed franchise program starts immediately. The highly experienced Indigos Franchising Management Team will guide you through our outstanding franchise program. We provide our franchisees with an array of advantages and extensive support services to establish, operate and promote your Indigos location(s). Our philosophy has always been "When you succeed, we succeed!" Our experienced Indigos Management Team is passionate and committed to developing and growing each Indigos location we open! We offer four different models to cater to our franchisees investment level and location preferences. Kiosk operations are a lower cost of entry and are generally placed in indoor shopping malls but can also be placed in many other environments including gyms, stadiums, train stations, hospitals and colleges. 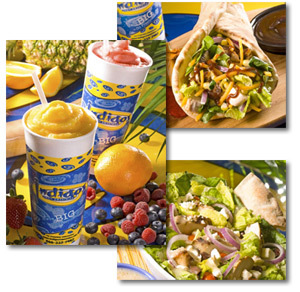 With Indigos responsible nationwide expansion plans in full motion, NOW is the perfect time to take control of your future and own your very own Indigos Fruit Smoothies, Salads and Pitas franchise. By joining the Indigos franchise system, you are positioned to capitalize on this strong, growing, fun and upbeat industry. Thank you for your time and we hope to welcome you to the Indigos family.